Woodridge, IL - July 18, 2018: Orbus Exhibit & Display Group®, one of North America's leading wholesale suppliers and manufacturers of display, exhibit, graphic and event solutions is excited to announce that the company has added four sales representatives to its Las Vegas, NV display and graphic manufacturing/supply facility since the beginning of the year, and expect to add more throughout the remainder of the year in response to growth demands. 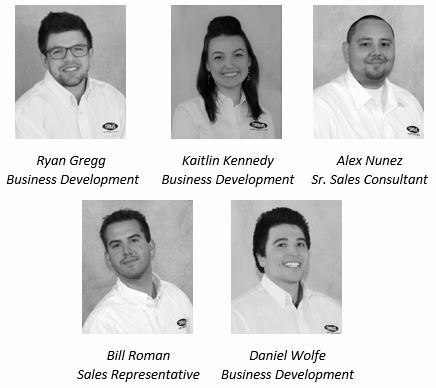 Sales staff now working out of Orbus Las Vegas includes: Ryan Gregg, Business Development Representative, Alex Nunez, Senior Sales Consultant, Bill Roman, Sales Representative and Daniel Wolfe, Business Development Representative. Kaitlin Kennedy, Business Development Representative is scheduled to transfer from Woodridge to Las Vegas later in the year. “We're very fortunate to have such a dedicated sales team willing to make the transition to Las Vegas in order serve our west coast distributors as efficiently as possible,” said Giles Douglas, President & CEO of Orbus. Orbus' Las Vegas office plays a vital role in the company's nation-wide, comprehensive offering. With both off-the-shelf and custom capabilities as well as a state-of-the-art printing facility, Orbus can provide west coast distributors with high-quality products without sacrificing turnaround times. Through building a west coast sales team, distributors will have even more opportunities to experience the award-winning service that Orbus offers.